How much do you know about Japan? Try our quick quiz and find out! Japan consists of approximately how many islands? What is currently Japan’s most popular spectator sport? 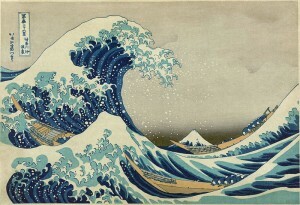 The Great Wave off Kanagawa woodblock print (below) is one of Japan’s most recognised artworks. Who was the artist? In 2010, there was a controversy about Japanese restaurants with Michelin stars. Why? What is the most widely practised cultural activity in Japan? This entry was posted	on Saturday 27 February 2016 at 17:08	and is filed under Japan, Trivia. You can follow any responses to this entry through the RSS 2.0 feed. You can leave a response, or trackback from your own site.